Enjoy views of New York Harbor, the Statue of Liberty, and Ellis Island, during this 60-minute sightseeing boat cruise. You’ll depart from the East Side of Manhattan before cruising under the Brooklyn Bridge and sailing within 100 feet (30 meters) of these famous landmarks, admiring One World Trade Center in the distance. Set sail from NYC’s Pier 15 in the morning, cruising aboard a three-level paddle boat for the ride out into New York Harbor, passing beneath the iconic Brooklyn Bridge en route. 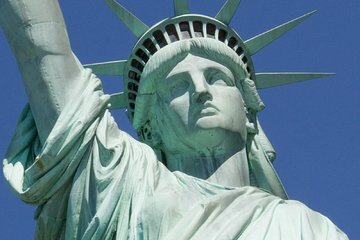 Then get an up-close look at the Statue of Liberty and Ellis Island, one of America’s original immigrant gateways, passing within 100 feet (30 meters) of these two NYC landmarks. On board your vessel you’ll also enjoy a range of indoor and outdoor seating, as well as a knowledgeable guide who will point out key sights from the water. Return back to Pier 36 at the end of the ride. I so appreciated the staff at the office! I had two elderly people in group of 17. We arrived 15 minutes before the office opened on a COLD morning. She allowed the two to come in and wait. Once it was officially open, we went in and redeemed the voucher and went back to wait. A few minutes before boarding a HUGE group of people arrived that packed the small room. The office lady came told one of my daughters she would let us board a little early and she did. As I watched the other group come aboard, we would have never been able to get the two elderly plus our 4 year old as well. THANK YOU, Viator for making our trip successful. The only complaint I might have was I did not realize we needed to be listening to our recorders BEFORE we left dock. Our guide was always way behind where we were so I was never really sure what I was looking at. I ordered the boat cruise plus the statue of liberty and Ellis island tickets. Only after paying did I learn that they were seperate boat rides. I wish I would have waited and bought my tickets through the national parks service. Very good tour, especially due to our tour guide Bonnie! It was a brilliant adventure to see the Statute of Liberty. The boat was well equipped with a bar and snacks. The staff were very friendly and welcoming. The actual visit to the statute was perfect, the captain turned the boat so that everybody had a really brilliant view of the statute wherever they stood.